with free shuttle service to the surrounding ski areas and free parking space at the house. Get away from everyday stress and rest a versa, even into the soul - that's winter holiday in Tyrol - in the middle of nature, the tip of the Alps. ... where the sun shines! 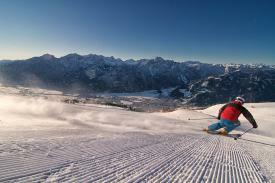 Experience own sun lounges to soak up the energy and challenging mountain in the World Cup Lienz ski Zettersfeld & Hochstein. Or would you like to go higher? Then we headed into the Glockner group or Molltal glacier. All within 10-30 minutes by car. ... uphill into the pristine winter happiness. 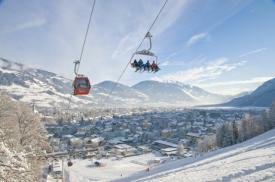 Welcome to the ski paradise Tyrol. Elsewhere gibts countless lifts, ski touring here, however, targets a penny for beginners and professionals alike. ... Breathe - breathe. You feel life. Moments of silence and the beauty of nature. In East Tyrol offers 400km of trails. Surrounded by the impressive mountains of the Lienz Dolomites can seemingly endless cross-country skiers leave their tracks in both classic and skating technique. ... for the whole family. 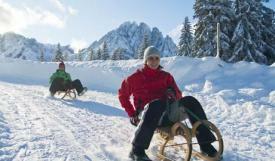 Winter Nostalgia as in earlier times: When "alternative program" Sled for sober life, many people want the fascinating winter landscape on your own and to discover at every turn. The 35 partially illuminated toboggan runs provide enjoyment for all generations until late into the night.